"Brief splashes into the scholarship of teaching and learning"
In V1N2 we examined parts of syllabi that convey important logistical information. In this issue, we'll examine the parts of syllabi that help us to build alignment into our courses. These parts largely address process. As in past issues, we discover we can continue to learn from dolphins, which offer some wonderful examples of the power of alignment. The individual dolphin's torpedo-shape, powerful musculature and air breathing are a great example of how evolution aligned traits to produce a marine creature with speed and incredible endurance. In Dolphins of the World, author Ben Wilson translates the dolphins' remarkable deeper dives for food into human equivalents: "You are on the top floor of the Empire State Building. Your lunch is on the ground floor. You have to charge... down the stairs, grab it, and climb back up again on a single breath of air." Clearly, there's no room for wasted energy here. Effective teaching and course design, when done with alignment, are much like dolphins' dives. It is possible to design our course so that our efforts produce extraordinary learning by diverting the least possible energy elsewhere. S. A. Cohen (Educational Researcher, 1987, v. 16, n. 8. pp. 16-20) recognized the power of such design when he coined the term, "instructional alignment." Cohen's alignment refers to consistence of design and enactment of efforts between intended outcomes, instructional processes and instructional evaluation (testing). He noted that classes that incorporate instructional alignment can produce two standard deviations learning beyond that achieved by usual classroom practices (Figure 1). Figure 1. The meaning of two standard deviations (2-sigma) increase from conventional class (left bell curve) to class with instructional alignment (right bell curve). In the latter, the bulk of the class achieves as well as the top 10% of a conventional class, and failure is almost unheard of. To an educator, Figure 1 is as impressive as the single-breath lunch dash. Instructional alignment seems to be the only known way we can provide a class of students with a learning mastery that approaches that which individuals enjoy when schooled by one-to-one tutoring (Bloom, Educational Researcher, June/July, 1984, pp. 4-16). Imagine that you are teaching young dolphins to accompany you on an incredible dive for lunch, and you draft a syllabus to address their needs. In any course, you will probably address equivalent key parts needed to align students' efforts with your own instruction, as shown by Table 1. What makes it worth my diving that far for it? Here's why I love this discipline... (enough to devote my life to it.) Here's what you will be able to do at the end of this course that you cannot do when you began. Here's what's in it for you. How do we get down, catch lunch, and get back to breathe? How we'll journey into this learning.... Expect engaging this material through methods and assignments that, while perhaps unfamiliar, are efficient ways to master this challenge. It's dark and scary down there. I won't know how to navigate in such an unfamiliar place. Tools exist through which to know what now seems obscure and difficult. I've done this many times; here are key points of my teaching philosophy that pertain to this experience. Here is the kind of support you can expect from me. You won't be alone; you'll be in the company of other students. Here's how you can help each other. You can trust me to lead you to good learning and treat you well on the journey. Table 1. Translating possible concerns of young dolphins to strengthening syllabi to meet equivalent concerns of students in courses. Instructional alignment is not a single practice, such as collaborative learning. Rather, it is enactment of an informed, comprehensive teaching philosophy. With alignment, all our course documents should be consistent with that philosophy. The syllabus is the most important document because it discloses both the plan for alignment and constitutes the first written document that permits our students to align their efforts with ours to learn with great efficiency. For example, if a professor aspires for his/her ideal class to exhibit the qualities of engagement, questioning and effort, these three key terms should appear in the syllabus along with an explanation of their meanings. Both aligning instruction and writing a good syllabus require that we know our students' preparation and aspirations, because we must connect initially at their level in order to convey what we want students to know and to be able to do. Students differ across regions and institutions, so a syllabus that coveys this well at one institution may prove an awkward fit at another. Students vary in their ability to read, study, write, or to think in ways that best promote their learning. In the syllabus, we can at least encourage students to study together, which is one of the most effective methods of learning. A good course syllabus discloses the process through which content mastery will occur. Students will be familiar with the lecture method, but not with interactive engagement methods. We need not detail intricacies of alternative methods in the syllabus, but the syllabus is the best place to alert students to expect specific methods other than lecture. Pedagogy also includes the assignments and exercises we create that allow students to grapple with material, learn from mistakes and achieve mastery. This mastery may occur before a final graded challenge, or the graded challenge, through designed reflection and revisions, may itself become a part of the pedagogy. This summer, at the Malibu Arts and Crafts show, I visited the booth of an artist who photographed dolphins. In one photo, taken underwater, the camera had caught a pod of these streamlined swimmers riding a large swell in perfect alignment, as they moved in on a school of fish. 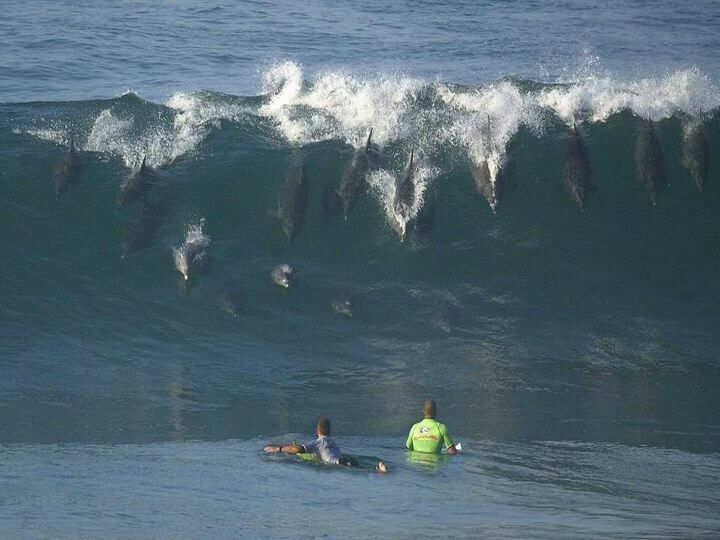 (For a similar photo of dolphins surfing in formation click here.) Dolphins understand that aligning their individual efforts with those of others produces surprising benefits. The scale we professors usually focus upon is that of our aspirations, our courses and ourselves. We can extend Cohen's work by further aligning our efforts with others at the larger scales of program/curriculum, institution/mission, and, sometimes, professions/licensure/certification. Although we may easily see the place of the course in these larger plans, our students likely cannot. The syllabus gives us the opportunity to assist students in understanding the place of their course within larger frameworks. As we shift thinking from just teaching courses to creating and offering curricula, we have the opportunity in our syllabi to shift our students' thinking from taking courses to becoming educated. Subheadings useful for this alignment include the place of our course within understanding of our discipline and/or the place of the course within the educational plan of a program (such as our major or general education) or institution (enacting the mission statement through instruction). Alignment influences everything from our getting to have fun by doing what we most want to do to producing better student learning. © 2005-2007 CSU Channel Islands. All rights reserved.